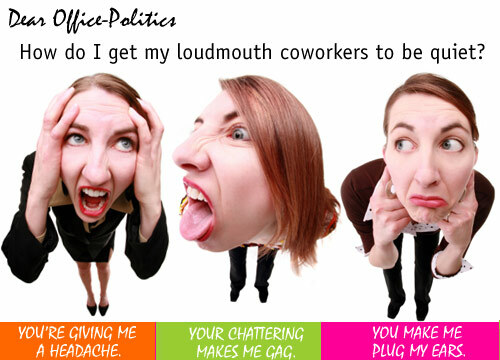 Office-Politics » How do I get my loudmouth coworkers to be quiet? I work as a Graphic Designer and while I love my job, I hate my work environment. I occupy a cubicle at the back of a large area and my problem is the people all the way on the other side of the room. They scream constantly and tend to get very personal, they are always yelling my name out and trying to involve me in conversations that have nothing to do with me. My job involves a lot of focus so I need a professional atmosphere. It’s a mother/daughter team and you hear conversations from what’s for dinner to who they don’t like. I complained once and the person told them everything that I said and it created a lot of drama and stress for me. I’m at the end of my rope so I need advice on how to handle this very delicate but frustrating situation. I feel your pain! I was just sitting in a coffee shop today, working on my computer, and there were two people in the corner yukking it up and talking really loud. It was frustrating and hard to concentrate — and I wasn’t even at work! So, what to do? First, let’s talk about the difference between complaints and requests. It sounds as though you haven’t actually requested that these folks behave differently – you’ve simply complained to a third party… which never works well. It’s usually even less effective than complaining directly to the person involved. Think about how you’d phrase a request to these folks to change their behavior – be neutral, and focus purely on describing the behavior you’d like to see. How about something like, “I’d like to ask you to talk more quietly when you’re at work. When you talk and laugh loudly, I have a hard time concentrating.” It might be a little embarrassing to say (and to hear), but it will work a heck of a lot better than complaining. In my experience, when you approach people in a respectful, neutral way like this, it’s unlikely to make the situation worse. In fact, I suspect it will improve. And if it does improve, remember to acknowledge and thank them for complying with your request… that will make it more likely they’ll continue to do it. Let us know how it goes. Thanks for writing to OfficePolitics.com. Erika Andersen is the author of BEING STRATEGIC (May 2009). Talk of strategy abounds in business — but moving from thinking strategically to acting strategically is an enormous leap. BEING STRATEGIC is a roadmap for consistently making choices that best move you toward your desired future. What’s more, it explains why being strategic is worth the time and effort required, what’s involved, and how to do it. The book explains the core skills and practices needed at each point of being strategic and provides simple models, real-life examples and self-directed activities for learning and applying them. Erika Andersen is founder of Proteus International, where she has served as consultant and adviser to CEO’s and top executives around the world. She is the also the author of Growing Great Employees, published by Portfolio in 2006. I’m in the same sort of situation even though my workplace isn’t a ‘family’ business, it’s just a whole bunch of people talking loudly and not taking into consideration that some of us are on the phone trying to talk to a customer. I love my workmates and feel I can say something nice like, “Hey guys, any chance you can turn your volume down a bit, I’m just on the phone,” and I do find if I’m nice and light hearted about it, they’ll say “whoops, sorry” and they will quieten down. Maybe try something like that, a nice, light hearted sort of thing. Working with people who irritate you or whom you feel you just don’t fit in with can be hard. I work in a small office and there is a distinct feeling that there is a ‘clicky’ lot who indulge in conversation over private/personal matters and if your not that way inclined, they ostrisize you! Yet, I would rather not get involved in their clickiness and stay independent from them – keeping my thoughts to myself and my personal matters to that. Why some feel it necessary to get so involved with work colleagues is beyond me – I am not made that way but you do feel ‘left-out’ to a degree too and feel that your very ‘different’ from them. Grit your teeth, don’t get too close but main thing is – do your work to our best advantage – afterall, your at work to do a job NOT to make ‘best of friends’ with people you certainly would not choose to make friend with out of work! GOOD LUCK to all those who are in this not-so-great situation as I am! I sit in a cubicle area that most of the day sounds like I am in a sports bar. Co workers yell back and forth to each other and more often than not it is not even work related. This makes it very difficult to stay focused and concentrate on detailed work. I have found that ear plugs work the best. I can block out the chatter, and get my work done stress free. I am not sure if this help, considering it has been nearly a year since you asked for advice. I hope it can help others you have similar issues at their work place. It all depends on what this job means for you. If this is just a short-term gig, then do what Erika has mentioned and also buy a set of earphones. Alternatively, if it means that you can accomplish big things here and it is important for you to stick around and gain the experience, then I suggest reading on. Confrontation in a work place is a common occurrence, how you deal with it is where the struggle is. As much I agree with Erika’s words, I have experienced that these days if you come clean and say how it is (even if you make it all neutral) people WILL get offended. You end up blowing all possibilities of an amicable outcome. First impressions last. I suggest if you cant beat them, join them. But by joining I don;t meant to part-take in their frivolous activities, but cajoling them to make them see the bigger picture and drive a positive result by influencing to do what you want. ‘How’ we get there is something to talk about. Leveling up (or down) with people, befriending them, buying them a coffee and ‘getting on their side’ is the ‘how’ in my opinion. This way you don’t burn any bridges that you haven’t even built, you come across as a mature, friendly, easy going person who removes emotion from the matter and attempts to resolve issues by putting boundaries around what is appropriate and what isn’t and finally you gain respect not just from them, but the staff around you (‘coz everyone is watching, especially your boss). Earplugs plus headphones has always worked for me. The key is to use both and to play either music you are very familiar with or the live stream of NPR. The reason for NPR is that their announcers speak in a soothing drone in contrast to the more high-energy announcers of talk radio. It always amazes me how executive powers can stroll through a cackling hen house and wonder why productivity isn’t up to snuff. Well I take that back. They’re smarter than that. They can’t find replacements. But when it’s time for a mass layoff, you can be rest assured the executives know exactly who the loudmouths are and who will get the axe first and promptly. What do you do in the meantime? Work diligantly and wear earplugs. You’ll miss the axe by a long shot.